For centuries, ginseng has been highly esteemed by the Chinese for its reputation for its amazing health benefits. Ginseng is perhaps most well known to boost our memory power and energy levels. Regular intake of ginseng helps to strengthen our vitality and strength, increase metabolism, refresh the mind, strengthen the physique and promote longevity. Ginseng is widely accepted to belong to one of 3 main types – Chinese ginseng (ren shen); American ginseng (yang shen) and Korean ginseng (gao li shen). Their names are not indicative of their country of origins but rather the species itself. They can be further divided into 2 categories – wild and cultivated. Wild ginseng is much more valuable and expensive and it can run into thousands of dollars for the rarer grades. I used to think that all ginseng soups are considered ‘heaty’ but this is not true. Korean ginseng for example, is more ‘heaty’ compared to Chinese and American ginseng. American ginseng is more cooling and is usually sold in 3 parts – the head, the root and the “beard” which looks like thick threads. Learn more about American ginseng here. Ginseng has a bitter flavor so it will take a little getting used to if you’re not accustomed to the taste. 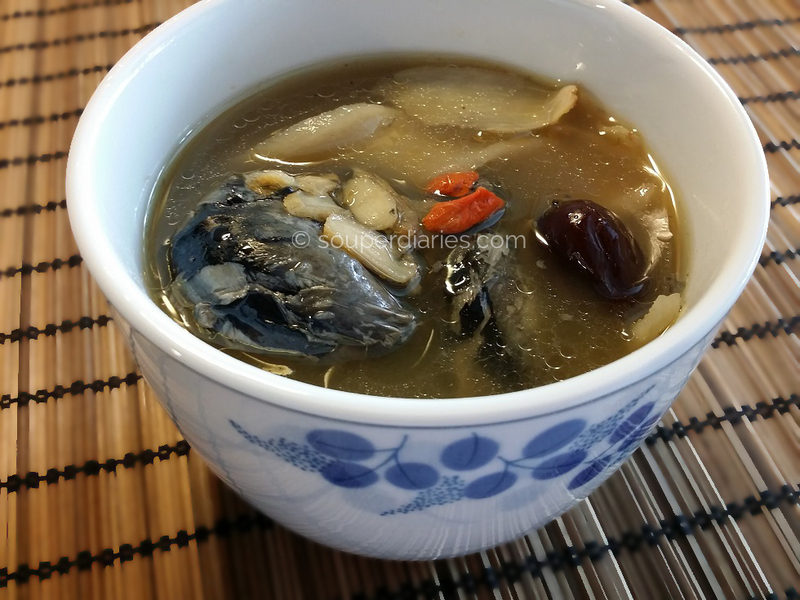 Reduce the quantity of ginseng in this recipe if you’re new to ginseng. But if you don’t mind slightly bitter tasting food, I recommend that you try out this soup. In Traditional Chinese Medicine (TCM), bitter flavors can help our bodies to clear heat. I used black chicken for this soup but you can also use a regular chicken. Black chicken are also known as Silkie (sometimes spelt as Silky) as they have a fluffy plumage that is said to feel like silk. 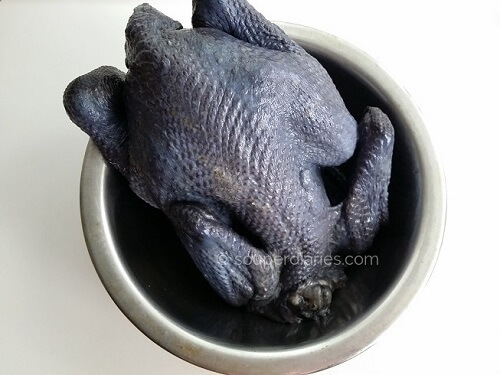 Black chickens are generally smaller than their more common counterparts and is valued as a curative food in TCM. The meat and bones of this chicken looks black and even the organs too. It was easier for me to cut it into pieces compared to a ‘regular’ chicken due to its smaller size. I find the taste of this little black bird to be slightly gamey compared to a paler breed. 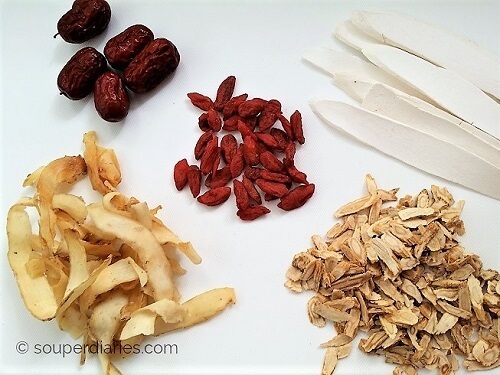 Clockwise from top left: Dried red dates, goji berries, huai shan, American ginseng and yu zhu. 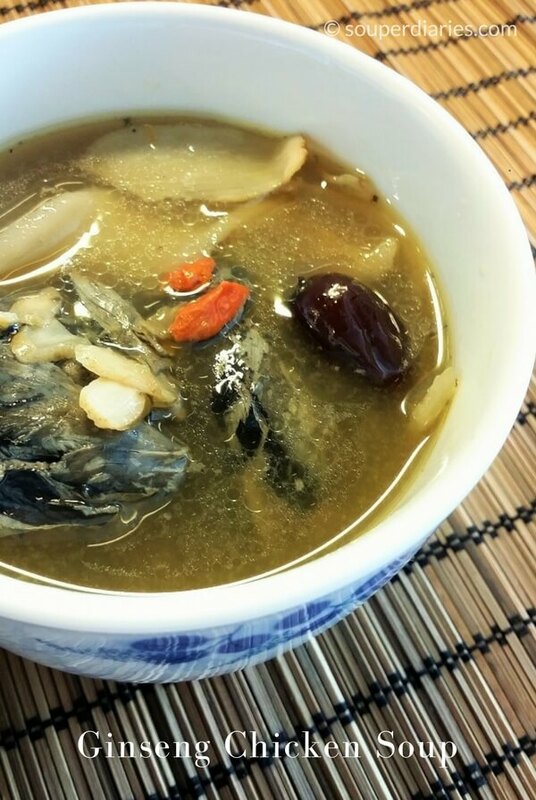 Other ingredients I added into this soup were dried red dates, goji berries, huai shan and yu zhu. They help to balance the bitter flavor of the ginseng. You may substitute the ginseng here with other types of ginseng; depending on what you have purchased. If you’re using dried Korean ginseng, you’ll need to use a smaller quantity as it is stronger and more potent. Cook the silkie chicken whole or cut it into large pieces. Parboil the chicken first before adding it into your soup pot. I used a claypot to simmer this soup for about 2 hours and the chicken meat turned out really tender. Slow cooker is also another cookware that is suitable for cooking herbal soups. Don’t want to miss a recipe? Sign up for Souper Diaries newsletter delivered to your inbox! Stay in touch on Instagram, Pinterest, Twitter and Google+ for the latest updates. See you again and happy souping! Blanch chicken in a pot of boiling water for about 5 minutes to remove scum and dirt. Drain and put it aside. Regular chicken may be used if preferred. 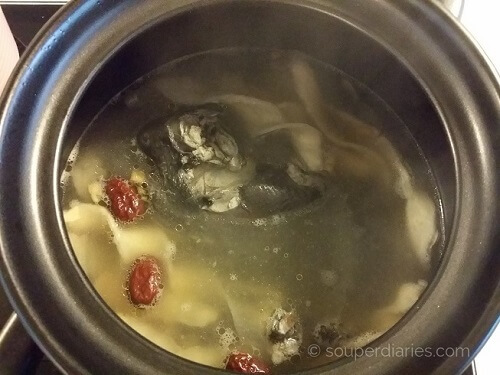 This ginseng with chicken soup recipe looks delicious and I’m sure if very health promoting. I’m very familiar with ginseng and have used it from time to time to boost my energy. When I was a kid in the Appalachian mountains I would often search for wild American ginseng, but it’s getting harder to find. Never heard of a black chicken before, that’s a new one for me. I’m glad to hear that you’ve tried ginseng before. It must have been an interesting experience to search for wild American ginseng. Black chickens are not as common as the usual paler breeds. You can substitute them with a regular chicken (preferably free-range or organic) if you can’t find the black ones.